If you have been thinking about buying one of the many high end homes for sale in Tallahassee, I suspect you are licking your chops right about now. High end home values have fallen, interest rates have tweaked down, and there might never have been a better time in the history of the Tallahassee real estate market to be thinking about "moving up." 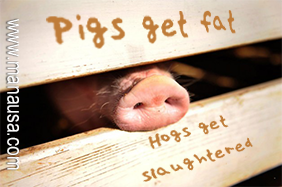 Pigs get fat, and hogs get slaughtered. If you get too greedy, you're going to get burned by one of two things (or both). If mortgage interest rates rise, then the money you hoped to save with falling values is going to be lost to higher mortgage payments. And even if mortgage interest rates don't rise and spoil your purchase, the glut of inventory will eventually dissolve and you'll be faced with rising values. So don't be so greedy that you let this buyer's market for high end homes get away from you. Now, if you are a cash buyer, you really only need to pay close attention to supply and demand for the price range of homes that fit your appetite. For most of the Eastern side of Tallahassee, the supply of homes for sale under $500,000 has returned to market equilibrium (meaning the market is in balance). That means neither seller nor buyer have an advantage due to supply or demand levels. The Western side of Tallahassee is another story altogether, though there are not nearly as many high end homes for sale to the West. 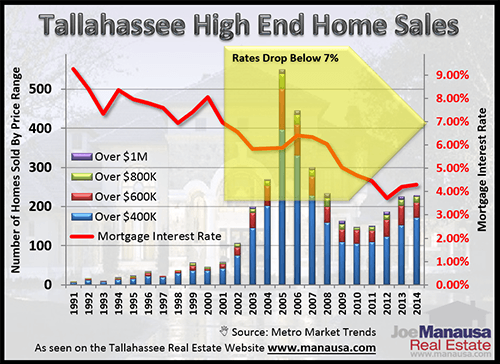 The following real estate graph shows high end homes sold in the Tallahassee MLS since 2003. The bars are measured on the left vertical axis, the lines are measured on the right. The blue (bars and lines) record sales and values for homes sold between $500,000 and $750,000, the red (bars and lines) record sales and values for homes sold for more than $750,000, while the green measures the same for all homes sold over $500,000. There have only been four high end homes sold in 2014, so the up-trend we are seeing thus far is just "noise" in the data. Hopefully, it will be reinforced when more sales are recorded throughout the year, but the imbalance between supply and demand suggests that will not be the case.